The church of St Mary the Virgin is in a rather lonely spot surrounded by fields and sheep, about a third of a mile from the village of Farnham in Essex and is the latest of our AIANO jewels. AIANO handcrafts traditional window guards for churches around the country, including St Mary’s. Sometimes it is good to recall projects we have done in the past, and we are publishing series of occasional articles under the theme, AIANO jewels. These articles focus on some of the churches where we have worked over the years that we consider remarkable or unusual in some way. Of course, every church is remarkable, and it is always a privilege for AIANO to work with churches helping to protect their stained glass heritage. However, sometimes something special captures the imagination. When AIANO engineers arrived, literally off the beaten track, at St Mary’s to install new church window guards, the church was shrouded in billowing mist, and our only company were the sheep grazing peacefully in the nearby fields…..
St Mary’s Farnham is a Gothic Revival Grade II listed building, that was built in 1858 on the site of a much older church dating back to 1247. The church is of interest for some of the beautiful Victorian craftsmanship that can be seen both inside and outside. 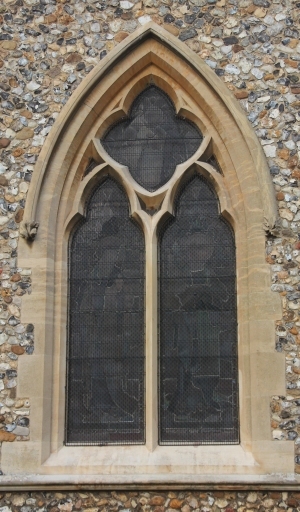 The church was partially funded by the Gosling family who feature prominently in the stained glass and other memorials. The church was designed by Joseph Clarke, a Gothic revival Victorian architect. When the church was rebuilt they chose to keep the original site rather than move it closer to the village. 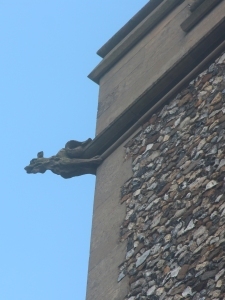 Thus, it is still to be found in its original remote location, about a third of a mile from the village of Farnham. Aiano’s was invited to provide new traditional window guards for a set of windows in the nave. AIANO has been handcrafting traditional window guards for churches for more than 150 years and have a wealth of expertise. First we visited the church to take templates of the window. After making the window guards, we returned to the church to fit the guards. The stained glass windows of the nave and chancel are by Hardiman of Birmingham, one of the world’s leading stained glass studios. Founded in 1838, Hardiman & Co stopped trading in 2008. Aiano’s had worked with Hardiman’s over the years, providing traditional woven mesh and weld mesh window guards for churches. 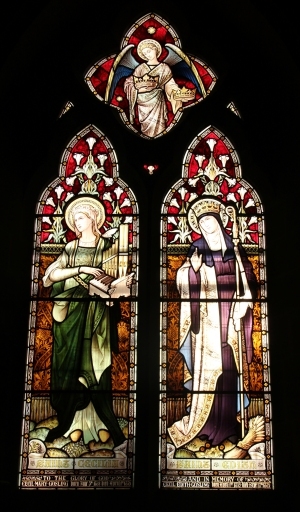 The windows to be guarded depict Saint Cecilia and Saint Edith and are a memorial to two female members of the Gosling family – Cecil Mary and Cecil Edith. Saint Cecilia is the patron saint of musicians and, at St Mary’s, she is depicted holding a small organ – pipes and a small keyboard. She was a martyr of the early Roman church, and the church of St Cecilia at Trastevere in Rome was founded in the fourth century, supposedly on the site of the place where she lived. Saint Edith was an English nun, a daughter of King Edgar of England, who lived in the tenth century. She became the patron saint of her community at Wilton Abbey in Wiltshire and other monasteries in Anglo-Saxon England. She is shown in the window wearing both the nun’s habit and a crown. She is said to have worn luxurious golden garments, which are also shown over the top of her habit. The reredos is by Farmer and Brindley, a well-known firm of Victorian architectural sculptors. 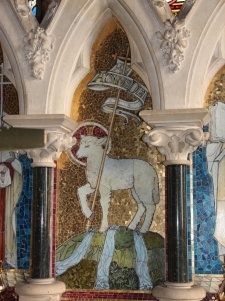 The mosaics on the reredos were commissioned to commemorate the rector W. J. Copeland, who was connected with in the Oxford Movement in the nineteenth century. The rector of St Mary’s was W. J. Copeland who was closely associated with the Oxford Movement in the nineteenth century which sought to revive the early Catholic heritage of the church. Copeland was friendly with the leading figures of the Oxford Movement, and was rector of St Mary’s for some 36 years. It was Copeland that brought about the rebuilding of the church with such care and some of the leading Victorian craftsmen and craft studios were involved in the work. The AIANO preferred method of fixing window guards is stainless steel screws, plastic rawl plugs and stainless steel tying wire. As practised by experienced AIANO engineers, it has the advantage of being virtually invisible from the front of the guard. It enhances the inconspicuousness of the guard, by not disrupting the parallel lines of sight of the stonework and the window guards. The window guards at St Mary’s fitted the contours of the individual lights and traceries perfectly. Fitting neatly inside the reveal, they are barely noticeable. 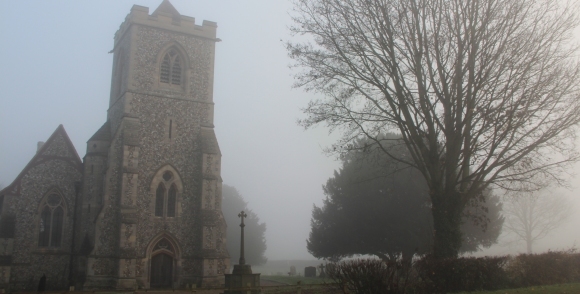 When our AIANO engineer completed his work at St Mary’s, he packed away his tools, and left the church in the peace of the mist and silence of the gathering dusk. Aiano’s is the leading maker of wire mesh window guards in the country. We have been making traditional window guards for churches and heritage buildings continuously with pride for more than 150 years. The production techniques have changed little in this time and our knowledge and expertise has been passed down through generations. We have expertise in measuring, producing and fitting complex-shaped window guards. A large number of churches and cathedrals around the country protect their treasured stained glass and leaded light windows using Aiano’s custom-made hand-crafted window guards. For more information about AIANO traditional church window guards do not hesitate to contact us. We can make guards to all sizes and requirements, and also offer site services. AIANO makes a wide range of guard products for churches, including radiator guards, pipe guards and floodlight guards. Please call Scott or Gokay on 020 7987 1184 or email us if you would like to discuss your requirements, or require further information or advice on AIANO guards.